MUST BE CLEAN and free of contaminants prior to sending them to Tactical Tailor for modification. Dirt and grime can cause damage to our sewing equipment. Excessively dirty rucksacks may need to be returned to the customer at their expense to be cleaned. 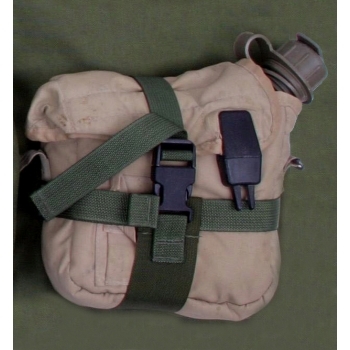 The Two Quart Cinch Strap modification lets you carry your large 2qt canteen on the outside of your rucksack for faster access. The straps feature an adjustable buckle to cinch the canteen tight and a quick release buckle to allow for easy removal. Please specify left or right side as worn. This mod cannot be done to medium ALICE packs. On the MALICE Pack Version 3, the mod can only be done to the right side.